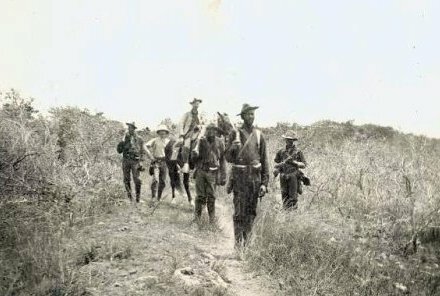 On this date in 1902, two African-American U.S. Army privates were hanged before a crowd of 3,000 at Guinobatan, Philippines for deserting to the anti-occupation insurgency. The 7,000 black soldiers deployed to put down Philippine national resistance against the American occupation faced an obvious conundrum: they were second-class citizens back home, fighting a savage war to keep Filipinos second-class citizens abroad. Men in such situations have been known to square that circle by going over to join their fellow downtrodden. It is without honor that you are spilling your costly blood. Your masters have thrown you into the most iniquitous fight with double purpose — to make you the instrument of their ambition and also your hard work will soon make the extinction of your race. Your friends, the Filipinos, give you this good warning. You must consider your situation and your history; and take charge that the blood of … Sam Hose [a recent lynch mob victim] proclaims vengeance. It was very small numbers actually induced by such messages to go so far as desertion. Leave hearth and home behind forever to fight a guerrilla resistance on the far side of the world against an overwhelming empire liable to kill you on sight? That’s a difficult sell. When the letter was found, its author, Sgt. Major John W. Galloway, was demonstratively busted to private and dishonorably discharged. Soldiers of the 9th Cavalry on Luzon Island. Edmond† Dubose and Lewis Russell, whose firsthand voice we do not have, must have felt those unreconciled strivings, too. These two enlisted men slipped out of the 9th Cavalry‡ in August 1901 while that regiment was conducting anti-insurgency operations in Albay, and were next seen fighting with those same insurgents. Captured, they were among approximately 20 U.S. soldiers death-sentenced for desertion. † Also called “Edward” by at least one press report. ‡ The 9th Cavalry was one of the original “Buffalo Soldiers” units. I wrote the above comment for a reason. That is, if you have children or grandchildren you do everything in your power to make sure that they do not join the US military. If they want to serve their country they can become a smoke jumper or a Department of Natural Resources Worker or something along those lines. The Coast Guard maybe. If you can not stop them make sure that they know you will support them if they say NO and it means that they do not get an honorable discharge. I am very proud of these 29 African American soldiers. They were the only real Americans on the battlefield. It is to bad that they did not have a name like the Saint Patricks Brigade so that people could have more easily learned the story of their heroism. When I was a child I thought that in every war that the USA fought in the Americans were the good guys. How could I think any different it was what we were taught. I went to college and took ROTC i considered myself very patriotic. But I learned new things in college. I learned that no only was the USA not only usually the good guy it was rarely the good guy in any conflcit. I was not alone. One young man a year a head of me came to the same conclusion and refused to be commissioned. He chose instead to pay back the money he recieved. I made a somewhat different decision. I decided that I would decide for myself if the time came if the US was engaging in a just war and refuse to fight if I thought that it was not. Before I was commissioned I sent a letter to the Army stating my intention. I said that I did not deem the war just I did not care if they threw me in prison and threw away the key. If a man is not prepared to go to prison for what he believes in why should you believe that he is willing to die for what he believes in. Of course in those days I had no family so my decision would have affected only myself. Those military officers and NCOs who say you have to go to war when you are ordered to do not know what in the hell they are talking about. The LT. Watada trial proved that I was right although those (insert cuss word here) will try to wiggle out of it on a technicality. The fact of the matter is the American people do not have the authority to wage a war of aggression and therefore they can not delegate such a decision to the government. Therefore the order to attack a nation that has not attacked the USA, or an ally of the USA is illegal even if the President of the United States were to directly give you the order himself. The order would also be clearly illegal if another nation were to counterattack an US ally after being attacked by this ally. This idea that the war is legal because the General, or even the Congress for that matter says that it is legal makes a complete mockery of the Nuremburg War Crimes Trials. Of course a lone soldier can not expect to prevail in the face of such madness and insanity. He could only suffer knowing that it is better to die a thousand times as a hated traitor than one time as a loyal nazi. The military did test my resolve. During a Reforger Exercise the Dutch Authorities complained about the lack of treads on the tanks that were going to be traveling over their roads. The American Battalion Commander did not agree with the Dutch assessment. I backed the Dutch however and insisted that the tracks on the tanks had to be changed. After the exercise was over our unit commander, LTC Irish had all the officers over for a BarBQ. He gave a talk about how the US in US Army meant Us. He gave us a pep talk about how we are supposed to work for the good of the USA. I did not take that sitting down though. In front of all of the officers in the unit I said we can not support the USA as military officers when the USA is wrong or else we are no better than the Wehrmacht officers that served Germany, who buy the way were serving a lawfully elected government. Needless to say I was not chosen to attend the officer advanced course. Although on the way home I was driving another Captian in our unit and he said that he agreed with everything that I said. I should add that my statements on that day may not have been the reason that I was not chosen to attend the advanced course. More likely it was the 5 or 6 times that I misplaced the units code books while I was distracted from reading. In my defense those books that I read where much more informative than the code books.